Meanwhile, Wolverine and Psylocke, using gear appropriated from the Magistrates they attacked, approach the Citadel. 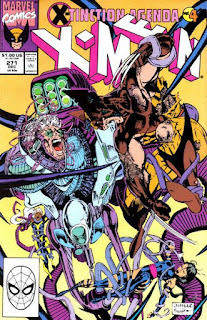 But when Storm's transformation begins, the psychic backlash weakens Psylocke. 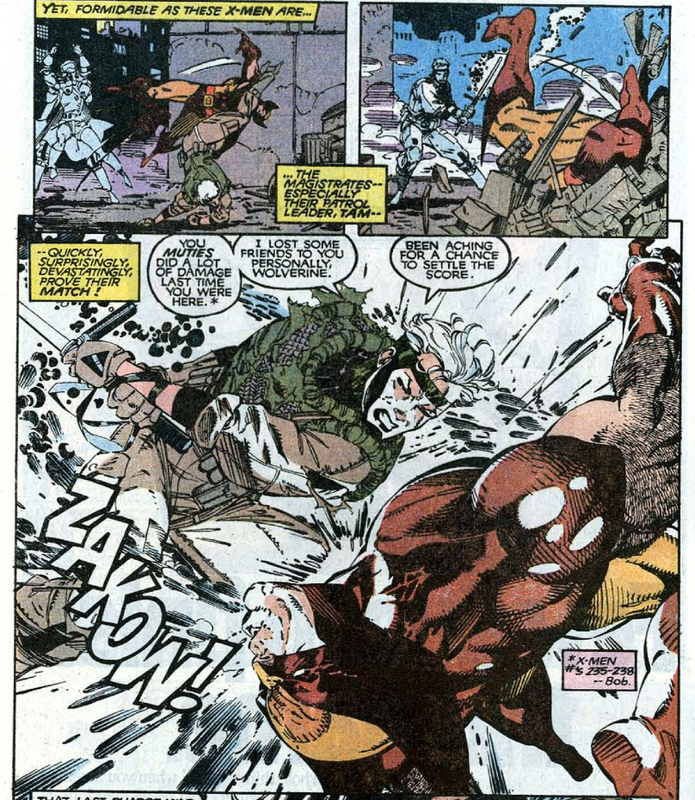 Wolverine plays it off as the result of a psychic mutant attack, but when Havok sees them and recognizes their gear, he immediately calls them out as imposter. He attacks Wolverine, but Psylocke recovers enough to use her psychic knife on Havok. 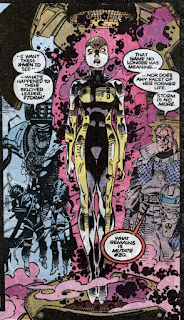 Tracking down Storm, the pair are confronted by Hodge, who manages to subdue and capture them just as the Genegineer finishes Storm's transformation and she emerges, no longer Storm, but Mutate #20. 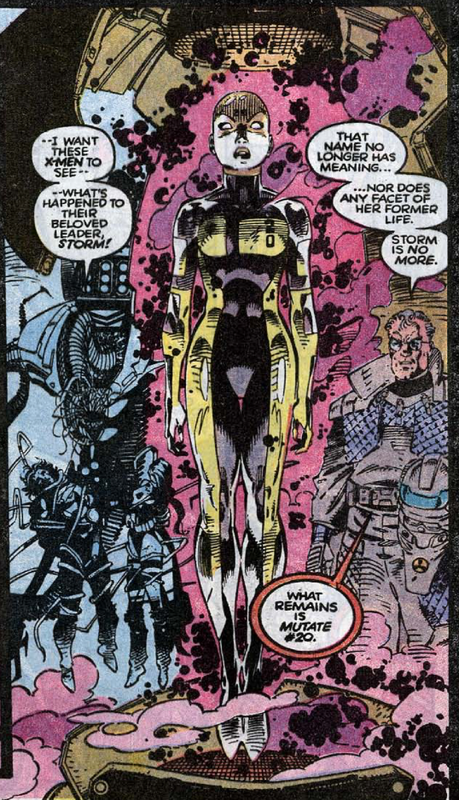 By issue's end, Storm is transformed into a Mutate at the hands of the Genegineer, though it's hinted that he altered the process somehow for her (using a "custom configuration", according to one of his monitors, during the process), a tease that will be paid off later in the story. This issue features the first (and then shortly thereafter, second) instance of Psylocke describing her psychic knife as "the focused totality of my psychic powers". 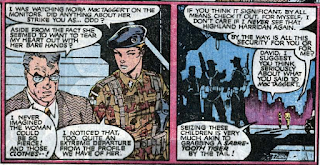 One of the more infamous (and widely mocked) Claremontisms, she had danced around the phrase in earlier issues, but this is the first time that exact wording (which will be repeated in future issues) is used. 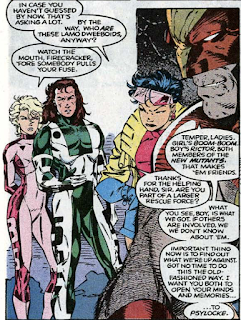 As of this issue, Wolverine is aware that Rictor and Boom-Boom are New Mutants, even though they joined the team well after the X-Men cut ties with the New Mutants (and really, even after the X-Men lost the ability to monitor their activities from afar), which brings up an interesting facet of this crossover: as much as it's about bringing the X-teams together for the first time and putting to bed the whole "X-Men are dead" ruse, much of that occurs off panel/between issues: here, Wolverine is somehow aware of the current New Mutants roster, while the New Mutants aren't at all shocked that Wolverine is alive (granted, they've been hanging out with Storm, who likely explained the ruse to them, but it would have been nice to see that. 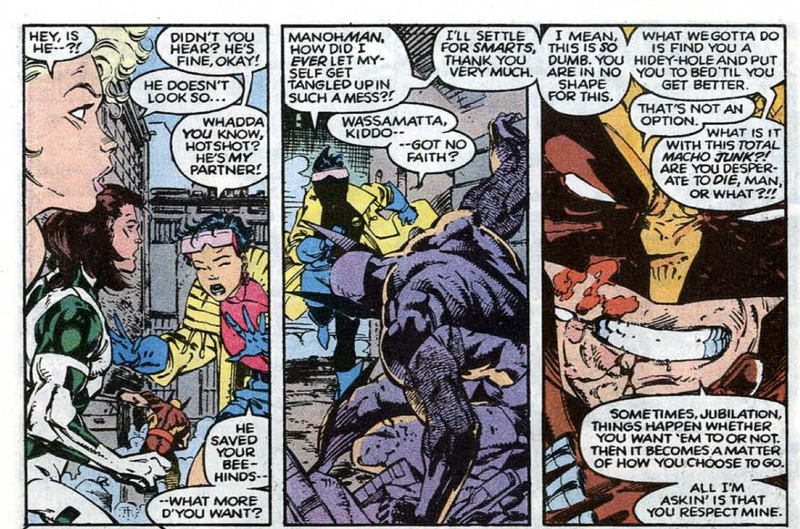 At the same time, even though Storm can fill everyone in on the post-"Fall of the Mutants" setup, she herself as no clue that the Siege Perilous was used nor anything about where Wolverine is, whether he's alive or dead, etc.). There's several moments like this throughout the story, as character introductions and reunions pass by mostly without comment, which is a shame, given just how long the books have been separated prior to this. Moira participates in an on-air debate with the Genegineer this issue, and even he can tell that she's changed as Claremont keeps the Muir Island/Shadow King plot simmering. This issue introduces the Magistrate Tam, a minor recurring Genoshan figure notable for her relationship with Havok. This issue once again opens with a Dramatis Personae bookending a series of panels featuring news coverage of the Genoshan situation. In Jim Lee's hands, the Genoshan President now looks like, you know, a normal human woman, rather than the grotesquerie she was via Bogdanove in X-Factor. 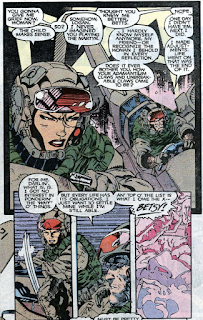 Manoli Wetherell, camerawoman to Neal Conan during "Fall of the Mutants", is now a reporter for NPR. 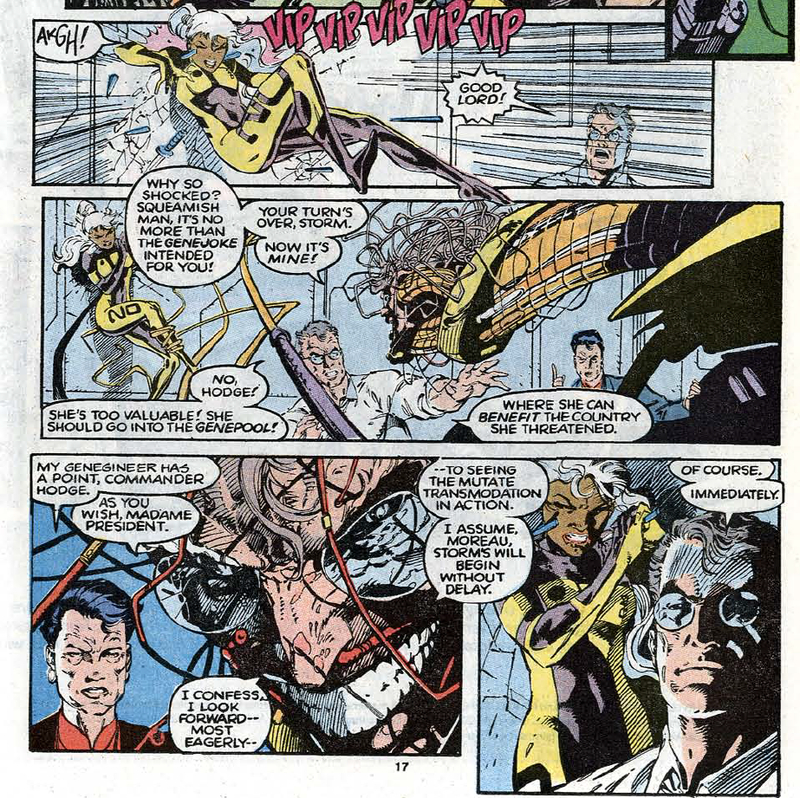 The Genegineer expresses his concerns to Chief Magistrate Anderson that Hodge doesn't have the best interests of Genosha at heart, and later confirms that it was Hodge who ordered the attack on the X-Mansion in X-Men #270. Psylocke is described as being "literal poetry in motion", and I'm not even sure what that means. What does literal poetic motion even look like? Continuing the "Wolverine has lost a step" subplot, he is visibly weak after the fight with the Magistrates, prompting concern from Jubilee. Psylocke asks Wolverine about the origins of his claws, and he responds simply that one day he didn't have them, the next day he did. 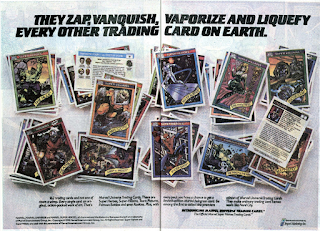 This issue features a two page spread for the Marvel Universe Series I trading cards. 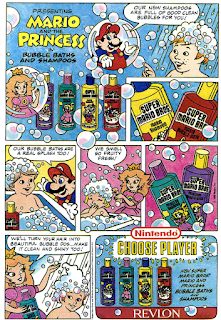 Wash the Goomba guts out of your hair with Super Mario Bros. shampoo! This issue welcomes Wolverine, Jubilee and Psylocke into the Genoshan fray, and in doing so, brings the trio the closest yet to an outright reunion with their remaining scattered teammates. Continuing the storyline's ability to keep a tight focus on specific characters even while unfolding the larger narrative, this also reads of a piece with the earlier Wolverine/Jubilee/Psylocke stories in issues #261 and #268, despite being Part 4 of "X-Tinction Agenda". Boom-Boom and Rictor are featured, of course, but the focus remains on the three newly-arrived X-Men, as well as on Storm. All together, the focus on the four X-Men also continues the crossover's tendency to shift the character spotlight from chapter to chapter so that the characters featured in a given chapter are usually the stars of the series in which the chapter is unfolding (so X-Men is focused on X-Men, big things happen to New Mutants in the New Mutants chapters, etc.). It's not quite on the level of being able to read only one third of the storyline and not be entirely lost, but it is relatively close, and thus far, ensures that anyone who might only be reading one or two of the series will, at the very least, see the characters they care most about in the given chapter they're reading. Which is a tricky balancing act to pull off in a crossover, especially one as formally structured as this. 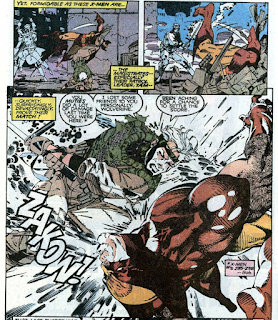 Tomorrow, Hodge captures some more mutants in New Mutants #96. Friday, the combined X-teams strike back in X-Factor #61. Next week, Excalibur guest stars in Thor #427-429. Wait. Isn't she the same as the Chief Magistrate Tamara "Tam" Anderson? Have they any amount of Tams running about, or have the quasi-official sources made a mistake in giving Tam as Anderson's name due to mixing them up? "Tam" is on awfully familiar basis with the Genegineer, or "David", at least, so one would assume she is a big deal in the Magistrates. Ok, checked it up. Two different characters. It must be one of those awkward two people with same first name incidents. My latter Tam above was Anderson. If she really is Tam. I feel like this issue's cover art was used for a house ad or a T-shirt or a poster or something. I just know I've seen it in a context other than as a cover. I think maybe the Wolverine image gets used somewhere? But maybe that's me misremembering, because I do remember trying to recreate that image myself back in the days when I still pretended I had some skill at drawing. Yeah, I completely brain-farted on that. Of course Wolverine met the New Mutants recently. I guess that speaks to just how many Wolverine appearances there are around this time, that even though those issues occurred right before this story, it still seems like ages ago because of all the comics we've examined since then. I do think my larger point still stands, though, that there's a lot of reunions and revelations between various characters around this time that mostly happen without comment, and that's a shame. Anyway, this issue provides the story with a much needed shot in the arm. Claremont and Lee operate on a much higher level than the other creators involved and the Wolverine/Psylocke/Jubilee trio works really well together. It's too bad the whole crossover wasn't told in Uncanny X-Men. Indeed. Or at least, had better art in the other two chapters. "Claremont and Lee operate on a much higher level than the other creators involved and the Wolverine/Psylocke/Jubilee trio works really well together. It's too bad the whole crossover wasn't told in Uncanny X-Men." This for sure. 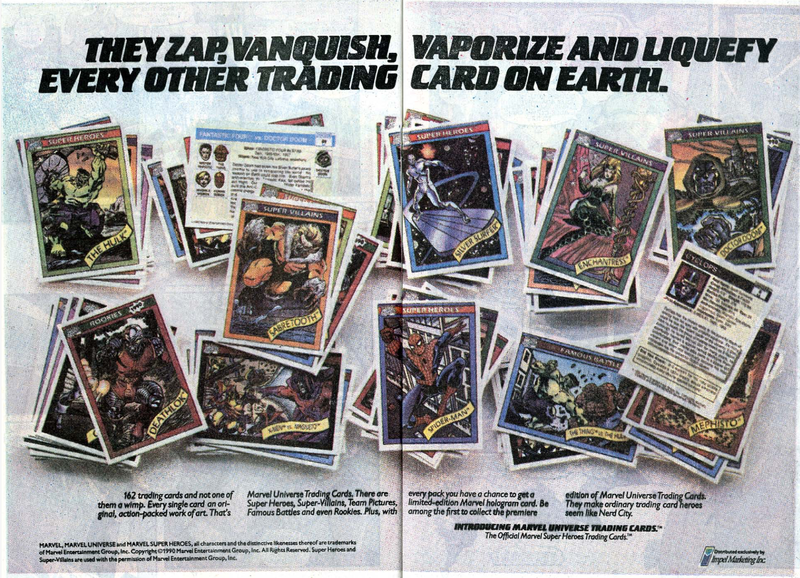 I feel like the other titles kept up better in Mutant Massacre, Fall of the Mutants and Inferno, but they definitely disrupt the story this time. I'd guess mainly due to the art. Honestly, I think X-Cutioner's Song is a better crossover overall. I probably prefer X-Cutioner's Song to this, though a lot of that has to do with it being the first crossover I read after getting into comics. Put me in the camp that also prefers X-Cutioner's Song to this. 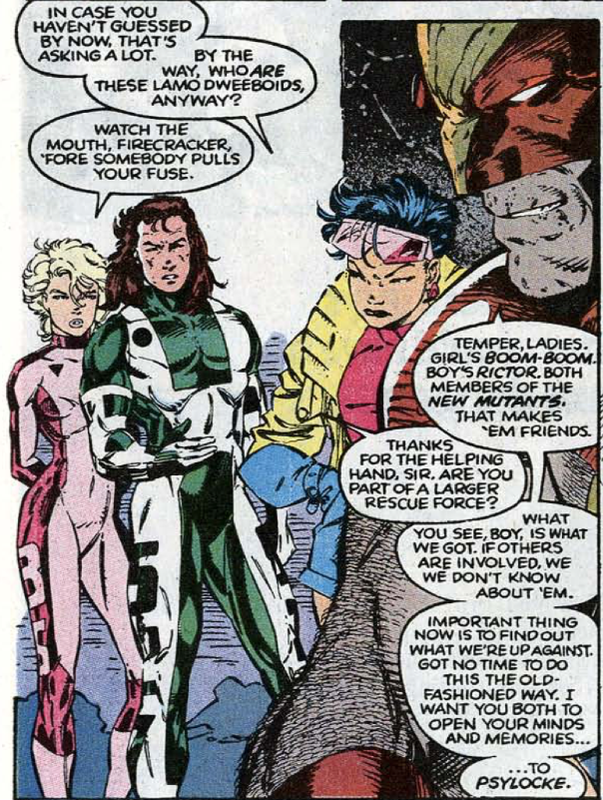 Lobdell and Nicieza just seem more in synch at that point than Claremont and Simonson here. Likely due to what was happening behind the scenes at this point. I was compelled to keep up with the other titles in Fall of the Mutants (which wasn't even particularly necessary) and most of Inferno. This, not at all. I've never read the any of the non-X-Men issues. As a crossover story, I prefer this to Fall of the Mutants and Inferno. FOTM isn't even a real crossover, while Inferno, while enjoyable, is something of a mess. The artwork for the other crossovers is much better than what we see here, thats for sure. Granted, FOTM isn't even a crossover, but you do have Walt Simonson and some of Brett Belvin's better art on this title. And Inferno doesn't exactly have Simonson's best art either, because, Milgrom! The whole relationship between Havok and Tam is best ignored. Havok must have emerged from the Siege Perilous anywhere from a few weeks ago to a few months ago, Marvel time. And yet somehow, he was brainwashed and still had enough time to rise up the ranks of Genoshan Magistrate system and find a girlfriend (enough that he admitted to loving her), and you have to wonder if either of them questioned why up until recently, Havok has no long term memories of life in Genosha, no family ties, no history, etc. Anyway, best not to think about it too much. 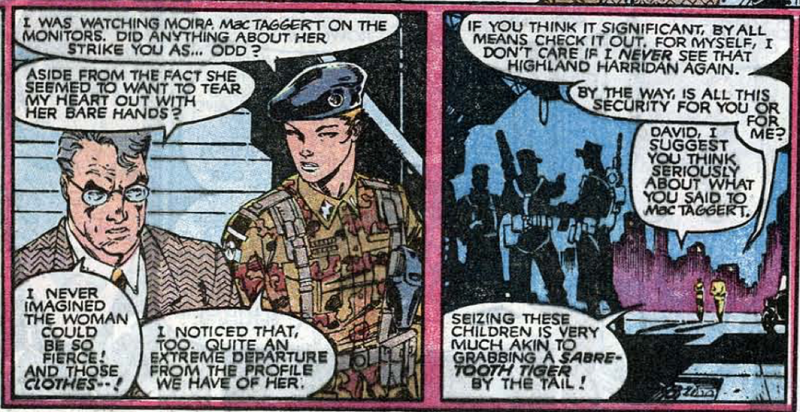 With regards to Wolverine knowing about Rictor and Boom-Boom...what everyone just said above. "and he responds simply that one day he didn't have them, the next day he did." Well, that is kind of true. At this point, he just doesn't remember his life pre-claws, no? 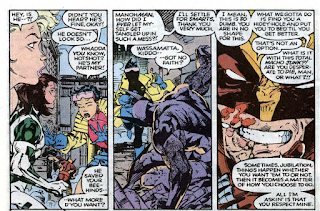 Still, I do like the bonding we get between Wolverine and Psylocke during this era. Too bad this relationship gets mostly ignored when CC leaves. Overall, its a strong issue. I do feel bad for Simonson, since if she had better artists on both books, her chapters of the crossover would be better received. As it is, the writing on her issues isn't that bad, and the momentum of the crossover itself does help get through the slog of not-so-great artwork during her issues. 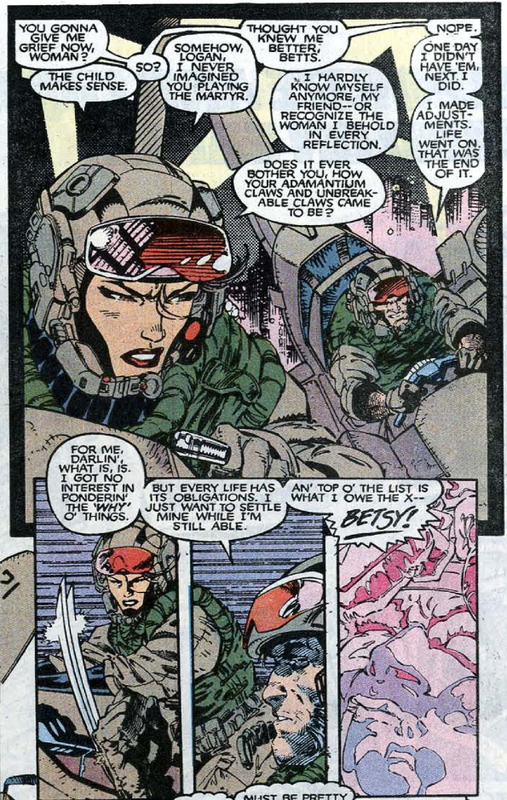 and you have to wonder if either of them questioned why up until recently, Havok has no long term memories of life in Genosha, no family ties, no history, etc. I've always assumed that some of that is like implanted memories, that while Havok just showed up on Genosha, he has memories that suggest he was born there, lived there, etc., and that Hodge (or whomever) manipulated records on the backend to accommodate that. Which, of course, still doesn't explain how or why any other Genoshans, like Tam, went along with the setup. So yeah, best not to think about. Yeah, I was just pointing out that at this point in time, that's his take on the origin of his claws. Too bad this relationship gets mostly ignored when CC leaves. Ditto the Storm/Gambit and Forge/Banshee relationships. We are fast approaching the single worst cover in the history of mainstream comic books. 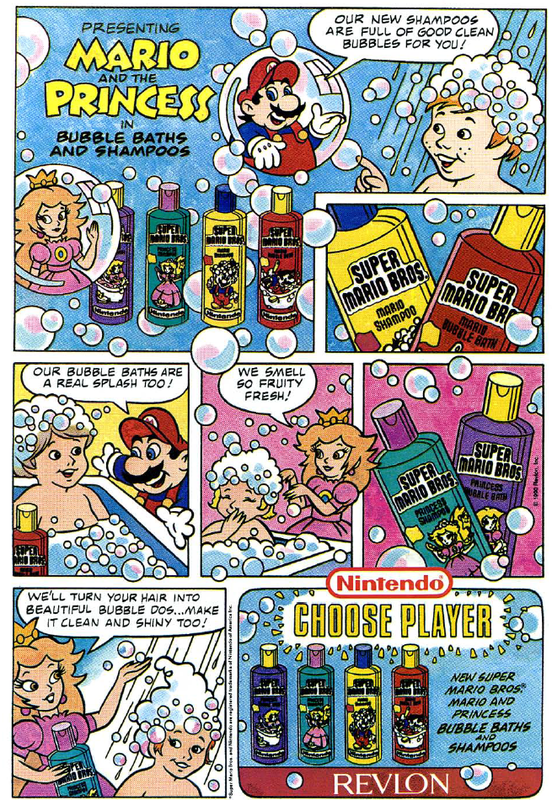 In the splash panel (no pun intended), Princess Peach is totally doing her best not to look at that kid’s deal. "Psylocke is described as being "literal poetry in motion""
A purpose of graceful fluidity, such that moves with tactful elegance throughout. A noun; abstract yet direct and completely beautiful to all 5 senses. "Princess Peach is totally doing her best not to look at that kid’s deal." Peach is a closet lesbian? The problem isn’t “poetry in motion” — a familiar and lovely metaphor. The problem is “literal poetry in motion” [emphasis mine], which should only apply to some weird species invented by Alan Moore or Grant Morrison that communicates in speech that visibly flutters out of the characters' mouths when spoken or be used sarcastically when you throw a Maya Angelou or Emily Dickenson collection across the room. I wouldn't say "literal poetry in motion" has ever bothered - I don't think I even noticed it until this most recent reading of the issue - I just realized I have no idea what "poetry in motion" would look like literally. Like, when someone says "I was so surprised that my head literally exploded", we all laugh to ourselves because we know that person's head didn't actually explode and "literally" was being only used as a form of emphasis, but we still can recognize what a literal head explosion would look like. Whereas I can't wrap my head around what "literal poetry in motion" would even be, even if Claremont doesn't mean it literally. It's important to notice it's "literal poetry" of non-static kind, and not "literally poetry in motion". Now, you can do pretty awesome things with oral poetry too, but I think we all agree if we have to liken Betsy's moves to poetry, they're haikus written in extremely beautiful kanjis, or maybe rather hanzis. "This issue welcomes Wolverine, Jubilee and Psylocke into the Genoshan fray, and in doing so, brings the trio the closest yet to an outright reunion with their remaining scattered teammates." It's difficult to express how huge this felt at the time. With the exception of the (intentionally) goofy "Men" standalone issue (#245) and a few pages in #246 where Logan says he'll be going away for a while, Wolverine was separated from the team since the end of Inferno, nearly 30 issues previous. Claremont's "shattered team" years weren't perfect (they could be especially frustrating to read month-to-month, but they hold up much better in collected editions), but that disorder gave real weight to the moments when the team slowly started to fold back into place.